Three years ago I stumbled upon the Zoo, started clicking, wandered into the forum and made friends. Then there was a request by Chris on the forum for people to check images for mergers, for which I wrote a website in 4 hours (including leaning SQL). This software with modifications has been used for all three Pea hunts, the Voorwerpje hunting, a few private hunts and for the Irregulars Project. A couple of years ago Kevin asked for ideas for a student project. Several ideas were made, including the irregulars. After the student went on to do something else (Peas), Jules and I carried on talking. As the Zoo was quiet (between Mergers finishing and Zoo2 starting), we launched our own project to categorise the irregular galaxies in the forum topic. This was endorsed by Chris, who initially acted as the project’s supervisor. What an amazing shape – what causes this? There has been a lot of work on the big impressive ellipticals and spirals, on mergers and detailed studies on a few nearby irregulars. However there has not been a large scale quantitative study of them. The project aims to fill that gap. We are using data originally collected by the Forum, not used by any of the Zookeepers so are not treading on anybody’s toes. These are the galaxies that don’t fit into any other category. They are not elliptical, they are not spiral, they are not involved in a merger. 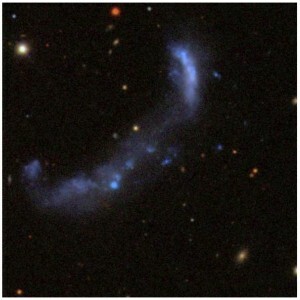 In general they are small, numerous and most are blue with star forming regions. Are they one homogenous group or is their more than one type? Are their old irregulars? Where are they? How do they compare with other galaxies? These are just a few of the questions the project is looking at. We started with the galaxies reported in the irregular topic on the forum, added those from a few related topics and started. Alice joined us in a supporting role and Aida came on board finding lots of other candidates, others have contributed lists and now the potential list is nearly 20,000 strong. I have managed the clicking on this in three data sets, the first 3,000 was the early reported – bright ones, then next 2,500 continued with the list in order of reported. However in the third set (nearing completion) I brought forward all those with spectra, so it contains 1500 ordinary candidates and another 2000 with spectra. The website was setup (Note this has an independent login from the rest of the Zooniverse). It asks 10 questions about each image: is it an irregular, the clarity of the image, bright blue blobs, apparent proximity to other galaxies, appearance of any core, bar, arms or spiral structure. How would you classify this? Jules has looked at their 2D distribution across the sky and estimated the number that are too faint for SDSS to have taken their spectra. I have already studied the colour properties of irregular galaxies, their metallicity, masses and star-forming rates, hunted for AGNs (none found so far in irregulars), the equivalent width of the [OIII] 5007Å line in the same way that the Peas were analysed and the non-applicability of Photo Z algorithms for estimating Z without spectra to irregulars. I am currently studying galaxy density around irregulars (in 3D) and am looking for clusters of irregulars. I have not yet used the sub classification of the irregulars, just the “is it an irregular property” – this will come. So I have signed up to take a part time PhD at the Open University on the irregulars. This will take several years, I will fund it myself. I am not totally new to doing formal research, in my professional life I had a lot to do with telecoms research: Proposing, taking part in, managing and cancelling many projects both company and EU funded at research houses and Universities, covering everything from social science through home networks to optical switching. I have even been on the other side of the table reviewing a couple of PhDs. At this point I have applied, have a supervisor, met them once. Chris and Bill are my referees. The formal interview is in March and the formal start of the PhD is in September. However I am working hard looking at your results, reading, analysing, thinking and writing this. I have created a blog on the forum to report day to day progress. P.S. I could use a few more clicks. Ein Artikel über Citizen Science und Galaxy Zoo ist in der Süddeutschen Zeitung erschienen, inklusive Kommentare von einem Mitglied des “Peas Corps”. Every decade, the US astronomy community gets its leaders together to write up a report on the state of the field and to recommend and rank major projects that should be supported by the government over the next decade. It’s a blue print, a wish list and often also a sober exercise in what to fund (a little) and what to cut (a lot). The current Decadal Survey was finally released by the US National Academies last Friday and every astronomer is poring over it to see if their project or telescope is ranked highly. Astronomy on television has come a long way since the 1980 PBS premier of Carl Sagan’s ground-breaking multipart documentary Cosmos. Many cable channels offer copious programming on a large variety of astronomical topics, and the big three networks occasionally offer specials on the universe too. Another barometer of the public’s cosmic curiosity comes from the popularity of IMAX-format films on space science, and the number of big-budget Hollywood movies that derive their plotlines directly or indirectly from space themes (including five of the top ten grossing movies of all time in America). 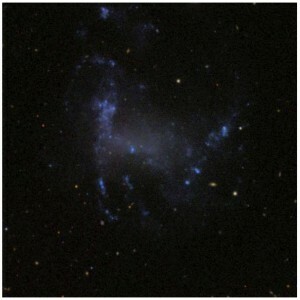 The internet plays a pervasive role for public astronomy, attracting world-wide audiences on websites such as Galaxy Zoo (www.galaxyzoo.org, last accessed July 6, 2010) and on others that feature astronomical events, such as NASA missions. Astronomy applications are available for most mobile devices. Social networking technology even plays a role, e.g., tweets from the Spitzer NASA IPAC (http://twitter.com/cool_cosmos, last accessed July 6, 2010). Thank you all for making Galaxy Zoo such a success!